Our house was built in 2001 on a heavily wooded old farm near Jefferson, Georgia some 60 miles north of Atlanta. We liked the fact that the developers had kept the old trees. However, we were also aware that they had graded too close to many of them, ensuring that they would die off in less than ten years. Add to that the drought conditions we’ve experienced during many of the years we’ve lived here, and you’ve got a recipe falling trees. The day after we got back home from the Thanksgiving holidays, one of the trees in the tree island in the front hard toppled over and damaged the roof over the garage. Fortunately, our insurance covered the repairs and allowed a little something for having the tree removed before the home owners association sent us a note saying, “Do you know you have a fallen tree in your yard?” Since this was the third tree to fall in 2011, we didn’t want another snippy note. 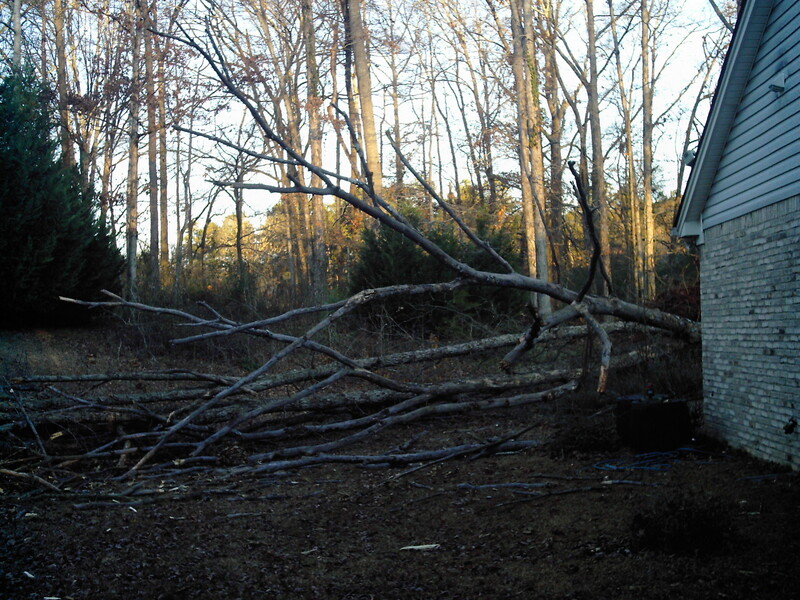 On new year’s day, two more trees fell. Fortunately, these missed the house. Unfortunately, the dead one knocked over a live one on the way down. While the tree people were here cleaning up the mess, they cut down four other trees that seemed to be aimed at the house. We hope we don’t have to call them again any time soon. When I see advertisements for houses on wooded lots, I often think: “Yeah right, the lot is wooded now, but how long will it stay that way?” Growing up in a subdivision in Florida where care was taken with the grading, I got a bit spoiled. We had 40 trees on the lot when we moved in and none of them fell down in the 33 years the family owned the house. Maybe we were lucky: they were all slash pines and several hurricanes came through town. We always had plenty of pine straw! As a tree city, our town keeps track of its percentage of tree canopy. Looks like the next survey (using aerial photographs) is going to show a few gaps in our neighborhood. Trees are people too. Some are rooted deeply to the land, and nothing will topple them. Others have a tenuous grasp at best, and it takes little to bring them down. I’m sorry you lost part of your woods; I know they are important to you. The more woods, the better. “My” trees do like to be considered as people. I couldn’t agree more. Last Christmas Eve, one of the large grandmother oak trees up on our road toppled in a torrential rain; it missed our house, but unfortunately, took out the barn behind the home below us on the hill–the barn where our landlord’s teenaged son lived! He was okay, but it shook them up. I grieved the loss of the ancient tree, and yet, when spring came, all sorts of beautiful things sprang up and burst into bloom, seeing the sun for the first time in who knows how long. Good can come from the bad. To paraphrase that video I posted on FB a few days ago, Nature’s law is neither good nor bad–the law is the law. Too bad about losing the trees but it’s good that you didn’t have more damage than you did! There was heavy wind damage in our area last week but we had no problems. For me living with the trees is worth the risks they present. Of course, falling trees are a part of the natural cycle. We tend to notice them when there in our favorite park or near our house. We’ve had some windty days, too, and before more of the powerlines were underground, that used to mean power failures. We still have the close streets and roads, though.